This low cost noise meter has been designed for simple noise surveys and sound level checks. Despite its full range of features, it is very easy to use and the large backlit display helps when measuring in poor light conditions. Due to its auto-ranging feature and simple push-button operation, this noise meter is extremely easy to use. Just switch it on and it is measuring with the most common settings: "A" frequency weighting and "Fast" time response. At the push of a button you can change it to display the "C" weighted sound level or change to "Slow" time response. The large display with back light make this meter ideal for measuring noise levels where the natural light is poor. Please note that for measuring occupational noise to national regulations, you should usually use a Type 2 Integrating Sound Level Meter rather than a simple non-integrating meter such as the NM102. For more advice please visit our Occupational Noise information page. For any noise monitoring application it is always wise to check whether there are any regulations that state the grade of meter that should be used and define the parameters that the meter should measure. 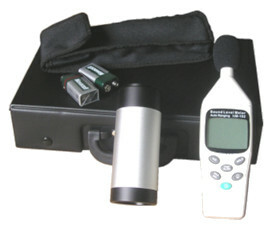 This sound level meter and calibrator combination have been designed to be very quick and easy to use. The hard carrying case protects the meter and calibrator but we also include the soft case so that the meter alone can be carried around without getting damaged. Before making a measurement, the calibrator is placed over the microphone and switched on to 94 dB(A). Any adjustments can be made automatically by simply pressing two buttons on the sound level meter. The meter calibrates itself. The calibrator is then removed from the microphone and switched off. The NM102 Noise Meter has been designed to be quick and easy to use. The auto-range feature means that you do not have to select the measurement range before making measurements, which is a problem with most sound level meters. With this meter you just switch on and it starts measuring the "A" weighted, Fast Sound Level, which is ideal for most applications.,The "A" weighted, Fast Sound Level is the parameter that is used for most applications. A/C Switches between "A" weighting and "C" weighting. For more information on these visit our Frequency Weightings page. Fast/Slow Switches between "Fast" time weighting and "Slow" time weighting. For more information please visit our Time Weightings page. Hold Holds the sound level that is currently shown on the meter - freezes the display. Max/Min Shows the maximum or minimum sound level. As this meter covers 30 to 130 dB(A) it can be used for many applications, from quiet offices to much more noisy environments. With its auto-ranging feature, it is particularly good for measuring noise that varies from quiet to very loud in a short period of time - a meter with manual range setting cannot do this as you have to stop measuring, change the range and start again. The NM102 Noise Meter is also very quick and easy to use. If you need to be able to pick the meter up and make a quick measurement, without fiddling with buttons first, then this is likely to be the best choice. Measure noise levels from quiet (30 dBA) to very loud (130 dBA). Make quick spot-checks of the noise levels. Measure the noise in low-light environments - the large, back-lit display helps. Monitor the maximum or minimum sound levels over short period of time. Checking levels in offices, hospital units and other "low noise" environments. Always check whether there are any regulations that you need to follow when making the noise measurements. If so, the regulations may give a specification of the meter that you need. If you have any doubts please email us for advice. If you are measuring noise in line with the US OSHA or European Noise at Work regulations (i.e. for hearing protection reasons) then you need to make your assessment using at least a Type 2 Sound Level Meter. The NM102 Sound Level Meter makes an excellent addition to your noise measurement kit, to keep in the toolbox for making quick checks. However, a true noise survey should be done using a suitable calibrated Integrating sound level meter.